PNG Line Up Surf Board donation and Government initiative to bring Surf tourism to PNG. Line Up Surf recently donated surf boards to the children of Papua New Guinea for an initiative set by the PNG government to get kids surfing. 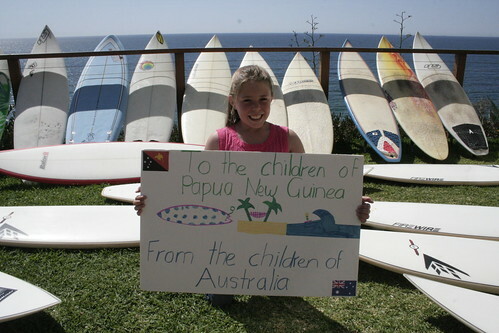 It was also to promote PNG newly opened surf laws in the country which allowed surfers to stay and surf in the country. There are now surf camps all over Papua New Guinea and it is one of the most affordable destinations for travelling surfers! Line Up helped the government launch its TV Campaign by donating the boards on Air to a local PNG surf club which accepted the boards! (who wouldnt!). We are not to sure whats happened to the boards now, but we hope there is some little kids out there in the jungle get barrelled on a fresh Line Up Stick! !